Benner’s Poly Deer Fence comes in a number of different varieties as well as many lengths and heights, to satisfy every need. 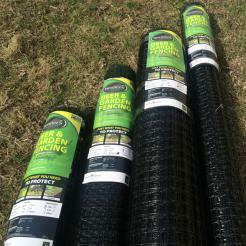 Our heavy-duty poly deer fence rolls come in lengths of 100’ and 330’, and heights between 4’ and 8’. Our standard Benner’s Advantage Fencing is extremely strong, however, for commercial installers and in areas with heavy deer pressure, we offer our Benner’s Advantage Plus Deer Fencing. The fence enclosure provides a humane and virtually invisible barrier that keeps deer out of gardens, nurseries, vineyards, and orchards, and away from trees, shrubs, farms, municipal parks, golf courses, busy roads, and so much more. 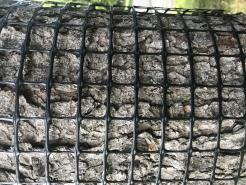 Our deer fencing is a safe alternative to chemicals or electric products. Benner’s Advantage Deer Fencing and Benner’s Advantage Plus Deer Fencing are both long lasting, strong and easy to install. Most importantly, our fencing products are virtually invisible and blend into the countryside, so they will not spoil your beautiful view. Once you install our Benner’s virtually invisible fence, you will not even know it is there! We sell all different sizes of our Benner’s Gardens Advantage and Advantage Plus poly fencing up to 10’ high! You can buy these in separately or we can customize a kit for you! Please call to inquire. Questions about starting your fencing project? Contact us today!